Playing card games remains one of the most popular pastimes in the United States because it is such a great way to socialize with others while having a few laughs. 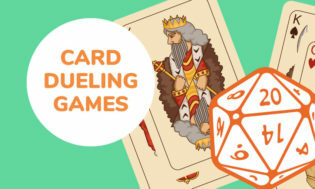 Teaching kids how to play card games will allow them to join in on the fun. Card games are a great opportunity for quality time and they also provide some excellent developmental benefits for children. 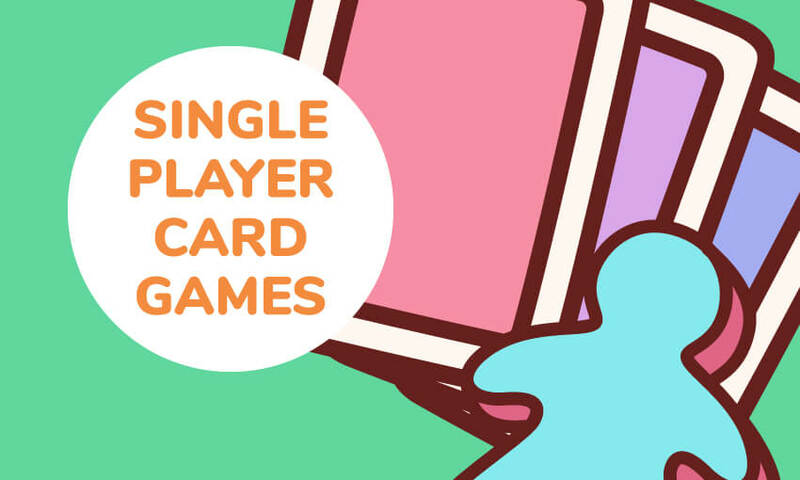 To help you get started, this guide will share 15 card games to play with kids. Regularly playing card games with your children is one of the easiest ways to improve their cognition. They will become skilled at matching cards, recognizing patterns, and thinking about how numbers work. Playing games like “Snap” or “Crazy Eights” will even improve their reflexes and visual acuity. Many card games have complex rules which must be memorized. 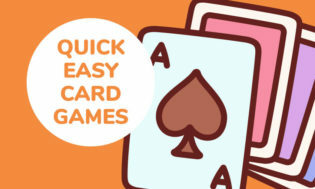 Games like poker and euchre will also encourage children to memorize the cards that have been already played to determine which cards their opponents may be holding. Playing cards is a great way to socialize. Your child will have some interesting conversations and lots of laughs as they interact with the other players. They will learn to win and lose gracefully, and will become more confident in their social interactions. Children can improve their mathematical skills as they play games like Blackjack or UNO. Young children will even benefit from simple physical acts like learning how to shuffle a deck and deal cards as it improves their fine motor skills. 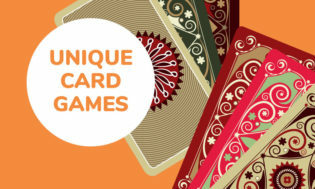 Card games like Solitaire, Blackjack, Euchre, and Poker require players to form strategies as they play. This will help your child learn to think on their feet. If you are worried about your children spending too much time by themselves on electronic devices, card games may be the answer. They provide a lot of quality time, during which you can enjoy a few laughs and have a quality conversation with your children. Accordion is a simple card game that is suitable for younger children. The goal of accordion is to compress the entire deck into one pile like an accordion. Holding the deck in your hand, begin laying out cards face up, moving towards the right. As you lay them out, look for matches between each card and the card immediately to its left or three cards to its left. You are looking for cards have the same suit or the same number. So if you put down a 7 of hearts, then the next card is a king of hearts, you can place the king on top of the 7. Continue placing and matching cards until all cards in the deck have been placed. You goal is to have the least number of piles possible. Watch this video to see Accordion being played. Streets and Alleys is like a simpler version of Klondike, which makes it suitable for slightly younger children. It can be used to introduce children to some of the concepts in Klondike, like having stacks of cards that go from Ace to King. Start by shuffling the deck thoroughly and dealing the cards into 8 face-up stacks sorted into two columns of 4 stacks each. Each stack should be spread out so you can see the cards that it contains. These two columns are the “streets”. There should be a space between the two streets to form an alley. Your goal is to sort the cards into 4 alley piles — one for each suit (♥♦♠♣). Each alley pile must be sequential, from Ace through to King. You are only allowed to move the outermost cards from the street piles onto an alley pile or onto another street pile. However, to move cards between street piles, they must be in descending order and alternate colors. That means the only place you can move a red 4 is underneath a black 5 — which is similar to Klondike rules. Continue moving cards until you have 4 alley piles completed or you can no longer see a move. Klondike is the world’s most famous single player card game. It is so well-known that many people will use the term Solitaire to describe Klondike, even though solitaire refers to any single player card game. Klondike is named after a Canadian region where a gold rush happened in the 19th Century, where prospectors used to play the game a lot. This game does have quite a few rules, so it is usually only suitable for children 8 and older. Klondike uses a normal 52-card deck with the jokers removed. To start the game, the player will shuffle the deck thoroughly, then place the cards into 7 piles called tableau piles. Each tableau pile has one more card than the pile to the left and ends with an upturned card. So, the first pile has 1 card with its face up, the second pile has one card face down and one card face up, the third pile is two cards face down and one face up, and so on. The seventh pile is 6 cards face down and one face up. View this image to see how the cards should look. After making the 7 piles, the remainder of the cards are are placed to the top left of the table. They are called the stock. There are multiple ways to draw cards from the stock, as I will explain in a moment. The goal of Klondike is to sort the deck into 4 piles of cards called foundations. Each pile is one of the four suits (♥♦♠♣) sorted from Ace through to King sequentially. You must move cards between the tableaus and use cards the stock to achieve this objective. The tableaus can accept cards of descending order that alternate in color. So, if you had a tableau pile with a red king on it, you could place a black queen on that pile. You can move all of the cards in a tableau at the same time, so a pile with a black queen, red jack, black 10, and red 9 can be moved in totality to a pile with a red king. When you move all of the face up cards from a tableau pile, you are allowed to flip the top face down card in that pile over. This eventually gives you access to all of the cards in the tableau piles. If all of the cards have been removed from a tableau pile, you can use this empty spot to place a King and start a new pile. There are different versions of Klondike, with different rules for how the cards in the stock should be handled. The most common version allows players to turn over three cards at once from the stock. The player can use the top card from the three on a tableau or on a foundation. If they use a card from the stock, they gain access to the card beneath it. Once the player has gone through the stock, they turn it over and go through again, with unlimited turns. If a player goes through the entire deck and can no longer see any places to move a card, then the round is considered lost. If they complete the foundations it is a victory! To see Klondike in action, watch this video. You can also play Klondike online. Cards games are even more fun when there are more players involved! War is a fiercely competitive game that can be played with just two players. The goal of war is to be the first player to win all 52 cards. Start by shuffling the deck thoroughly and splitting it into two even piles. Each player receives one pile and flips the first card on top simultaneously. Whoever had the higher card gets to take both cards and adds them to the bottom of their deck. Aces are considered the highest card in the deck in War. Players continue turning their cards simultaneously. In the event of both players turning over a card with the same value, both players shout War! and the the war begins. They then take the card off their deck, place two more cards face down on top of it, with one final card face up. The value of the face up cards are calculated and the person with the highest value wins all of the cards involved in the war. If the cards are still the same value, the war grows larger with 3 more cards added per player until someone wins. This is a fun multiplayer game that teaches children more about numbers and patterns. It is suitable for children aged 4 and up, and can be played by up to six players. The object of the game is to collect the most four of a kinds. A round of Go Fish starts with each player being dealt a hand that they don’t show to anyone else. If there are between three to six players, give each player 5 cards, if there are two players, deal them out seven cards each. The remaining cards are placed in the centre of the table face down. Pick a player to go first. That player will ask someone else for cards in order to get four of a kind. For example, if a player already had two 4’s, they might say “Dave, give me all of your 4’s”. If Dave has any 4’s he has to hand them over. If the player successfully obtained additional 4’s, they will get another go. If Dave didn’t have any 4’s he will say “Go Fish”. The first player must draw a single card from the deck. If that drawn card is a 4, they must show it to the other players and their turn continues. If they draw another kind of card, their turn is over. It will then be Dave’s turn because he was the person who said “Go Fish”. Whenever a player manages to get 4 cards of the same value, they will remove them from their hand and place them on the table, face up. If a player ever runs out of cards, they will draw 5 more cards from the deck. The round is over when all cards have been used. At that point the player with the most sets of 4 cards wins. 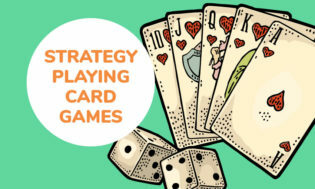 Strategic card games require a little more thought and are a great way to encourage children to think about their choices. This game is played with a specialized “Zeus On The Loose” deck. It is suitable for ages 8 and up. The goal of this game is to reach the top of Mount Olympus and catch Zeus. To do so, players must play their cards strategically, adding the values on those cards to climb up to the top of the mythic mountain. The game starts with each player receiving 4 cards. Each card has either a number on it or a Greek god like Hermes or Apollo. Each Greek god has a different power, like changing the value of cards. Each player is trying to get to 100 to reach the top of the mountain. The game begins with each player using a number card and taking another card from the deck. As the number cards are player, everyone needs to count the total. When a Greek God is played players must calculate how it affects the total. Players can also steal Zeus in a number of ways. They can play a card that brings the total to a multiple of 10 (10, 20, 30), they can play a Greek God card that says “you can steal Zeus”, or they play an identical number card (playing a 3 on top of a 3). It’s a fun game that improves maths skills while teaching children more about Ancient Greece. Learn more about Zeus on the Loose. 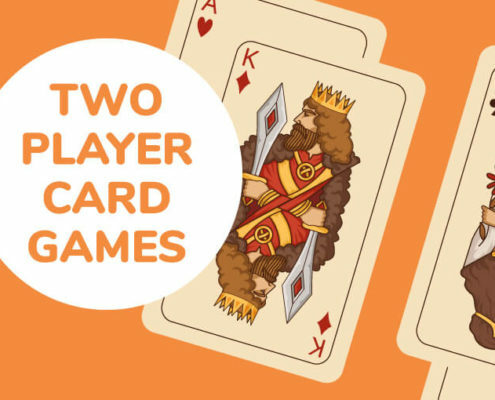 These simple games are perfect for younger children who may be learning how a card deck works for the first time. Crazy Eights is an action-packed game for between 2 to 7 players. The goal of the game is to be the first player to get rid of all of the cards by placing them in the discard pile. This game can be played by children aged 4 and older. The round starts with a dealer giving 5 cards to each player (7 cards if there are more than 4 players). The remainder of the deck is placed in the center of the table, face down. The top card of the deck is turned over and placed next it. Players can then discard one of their cards if it matches the rank or the suit of the card in the centre of the table. The 8’s are wildcards that can be played on top of any other card. When you play an 8, you can also nominate which suit the card is. That means you can play an 8♦ and tell everyone to treat it like an 8♥. If a player does not have a card that can be played, they can draw up to three cards from the deck and then pass if they can still not play a card. For example, if the flipped card in the middle of the table is a 7♣ a player might play a 7♥. The next player could play a Q♥ which might be followed with a 2♥ and so on. The round ends when one player has managed to play all of their cards. At this point, they will receive a “payment” from the other players based on the cards that they have left. 8’s are worth 50 points, court cards are worth 10 and the other cards are worth their face value. So, if a player has a 7, Jack, and Queen remaining, they give the winner of the round 27 points. The winner of the game is the first player to reach a certain number of point. For games with 2 players, 100 point limits work well, for four players use 200, and for 6 players use 300 points. 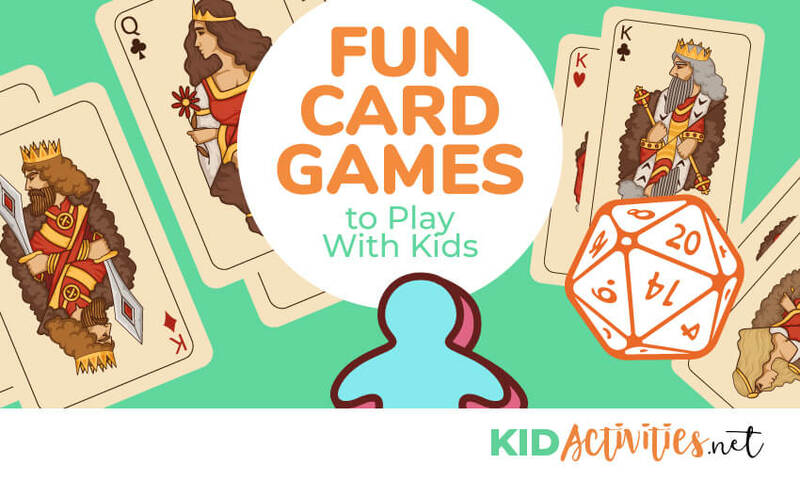 This classic card game is a ton of fun and suitable for very young children. It has a very strong focus on accurate observation and motor skills, with the fastest player winning. Snap has been enjoyed by children and adults since the 19th Century. It is believed to have been based on Snip Snap Snorum. The object of snap is to win all of the cards. The game starts with the cards being shuffled and divided equally between all of the players. Each player keeps their cards hidden. Then, going around in a circle, each player will turn their top card over and place it on the middle of the table. When a card is placed that has the same face value as the previous card, players will yell Snap! and attempt to place their hand on top of the pile of the cards. The player to successfully touch the pile first wins all of those cards and they are added to their hand. The winner of the game is the person who successfully wins all cards. This game shares some similarities to Snap, but involves a little more thought. This game is suitable for children 6-and-up and for between 3 and 6 players. The dealer shuffles the cards and deals the entire deck out to the players. Each player will then look at the cards they have received and sort their hand by card value (placing all of their 3s together, all of their 10s together and so on). The player to the right of the dealer will then play one or more cards of the same value. If they play a single card, they won’t say anything, but if they play a pair, they will say “Snip”, or if they play three of a kind they will say “Snip Snap”. If they has all 4 of a certain card, they will say “Snip Snap Snorum” and also get another turn. In fact, whenever a player plays the 4th card of a set they get to say Snorum and get another turn. If a player didn’t play the 4th card of a set, it will be the next player’s turn. If a player doesn’t have a card of the same value, they will skip a turn. The game continues until someone has played all of their cards and is declared the winner. This is another simple card game ideal for younger children. It can be played by anywhere between 3 and 13 players using a single deck of cards. The instructions for Pig are simple. Begin by sorting the deck into piles that are 4 of a kind. Each player will then choose a pile to be their chosen card. If you are playing with young children, have them choose cards that are very different looking, like kings, aces, and 8’s. Discard the rest of the piles and shuffle the cards that the players have chosen. The aim of the game is to collect your chosen 4 of a kind once more. Deal the shuffled deck out to the players. Have each player look at their hand and choose a card to discard. They will put that card on the table to their left and pick up the card to the right. Try to get a rhythm going, by singing a nursery rhyme of some kind. When one of the player has 4 of a kind, they will push their nose back so it looks like a pig snout (or stick out their tongue). The other players must then do the same, with the last player to do so losing the round. The last player to react will then have the letter P assigned to them. If they lose again, they will get an I and if they lose a third time, they get the G to spell out “PIG” — at which point they are out of the game. After a player has 4 of a kind, the cards are re-shuffled and re-dealt to start the next round. This is a simple game for 4 to 6 players from the age of 6 and up. Children can pick it up very quickly and enjoy playing it. This game uses a full deck of cards for 6 players. If there are 5 players, remove the 2’s, 3’s, and 4’s. If there are 4 players remove the 2’s, 3’s, 4’s, and 5’s. The game starts with each player cutting the deck and taking a card. The highest card will be the dealer. They will shuffle the deck and give each player eight cards. Players will sort their cards by suit. The player to the left of the dealer places a card face up on the table. Subsequent players must place a card of the same suit. Play continues until someone cannot place a card of that suit. They must pick up all of those cards and add them to their hand. They must also place a card of a different suit. The winner is the player who runs out of cards first. Magic the Gathering is one of the world’s most popular strategic card dueling games. It can be quite complex, so it is only suitable for children 12 and older. It requires unique card packs, but players can also buy full sets of Magic the Gathering cards. The rules for Magic the Gathering can be quite complex, so we’d need more than a single article to describe them. But in basic terms, it is a card trading game where players use a deck created from cards they own. Players normally use 60 cards with no more than 4 of a single type of card. The game is a battle between wizards who can use artifacts, spells, and ancient creatures to attack each other. Each wizard has 20 life points and will lose the game if that is reduced to zero. The game begins with players shuffling their decks and drawing seven cards. The two basic card types are “land” and “spells”. Placing land cards will increase the amount of mana that a wizard has, which they use to cast more spells. There are several types of spells including “instants”, “enchantments” and “sorceries”. Players continue placing cards to build their mana and beat their opponent. It is an exciting, competitive and strategic game that both adults and children can enjoy. Learn more about Magic: The Gathering. Unstable Unicorns is a creative game for children over the age of 14. If your kids love the idea of unicorns battling it out with one another, they will love this game. It requires a special Unstable Unicorns deck. Players take turns playing cards that affect their own stable and those of their opponents. Gradually, they build a larger stable in an effort to win. This is one of the most unique card games released in the past few years. It uses cards to start interesting conversations between family members. It helps children communicate more effectively and encourages critical thinking. Playing the game is simple, just take a card from the deck and read the question aloud. Each family member then gets their chance to answer the question. Who is one of your heroes and why do they inspire you? What would you like to change about your school? How does a person become courageous? Children love answering these kinds of questions. It helps a family learn more about each other by asking questions that don’t come up very often. Thanks for reading 15 Card Games For Kids! Do you have any card games that you love to play? Leave a comment below. Need more game ideas? Check out these trivia board games.